Check out our monthly newsletter: "The Finish Line"
Like an '86 Margaux, some things just mature with age, and one of those is the good ol' newsletter. 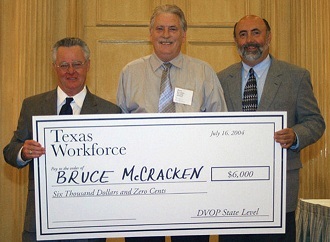 So we asked another fine vintage, HfS senior analyst, Bruce McCracken, (whose claim-to-fame is once receiving a fat check from the State of Texas), to pull one together for us. This month we've featured industry dignitaries such as Vinnie Mirchandani, Naomi Bloom, Ben Trowbridge and Mark Trepanier airing their views about Mahindra Satyam's re-emergence and AON's takeover of Hewitt. And don't miss a superb interview with EquaTerra's Stan Lepeak, discussing the latest Industry Pulse and its new findings on Cloud Computing adoption. Bruce McCracken (pictured center) is senior analyst at HfS Research, and editor of the Finish Line. You can read his bio here. You can submit news and views that you deem appropriate for inclusion in future Finish Lines by emailing Bruce at bruce dot mccracken at horsesforsources dot com. A great read - well done! Are the authors sufficiently familiar with the accounting fraud perpetrated in Satyam and of the true financial position of the company to be able to say MS has turned the corner? While some of the larger customers have seen this as a chance to negotiate more attractive rates with MS and MS has positioned these as the anchor customer staying the course, the larger ethical questions against Satyam will remain until the cases against the officers of the company are withdrawn.